I did hear the name Onheil mentioned occasionally, but I did not know that they had started back in 1999. This Dutch black metal band is known in the black scene in Holland, but I don't think that they are very well known outside our country. In March 2007 the band got more serious and after playing some festivals, they made a Promo-CD in 2008. With this CD they got the record deal for this new album. Today's line-up has besides drums and bass, 3 guitarists of which two do the vocals, this gives them more possibilities to expand their sound. This two different vocalists gives the songs more variation. 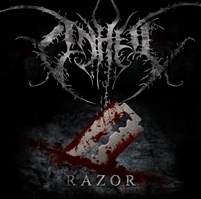 Onheil has a lot of melodic guitar parts, the fast twin guitars can be found in most of their songs. Sometimes the tempo is a little slowed down, as it is in the first minutes of the last track "From Above", but most of the time the songs are on high speed. The band has already been described as the black metal version of Iron Maiden! I don't think they are that far yet, but perhaps it can give you an idea of how they sound. Not a bad record from this Dutch blackened metal guys, fans of bands such as Dissection, Absu and Immortal should take a listen.